Asian countries are among the most dynamic economies in the world. As a result of their rapid growth, several countries are experiencing skill shortages in higher-technology manufacturing. As a response, they have ambitious plans for increasing vocational education and training as part of their national development plans. However, it remains to be seen how these plans will be implemented at the local level. 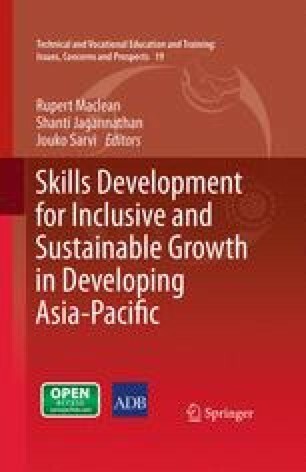 This chapter is divided into three sections: (1) skills challenges faced by Asian countries, (2) strategic approaches to skills development in Asian countries and (3) emerging policy themes. It draws on data and analysis from 15 countries: Australia; Cambodia; China; Hong Kong, China; India; Japan; Korea; Malaysia; Mongolia; Nepal; Pakistan; Philippines; Singapore; Thailand; and Vietnam. Skills development is high on the sustainable growth agenda of developing Asian countries. Those Asian countries which depended on their cheap labour and exports for economic growth are increasingly finding that their growth is being limited by the deteriorating terms of trade and vulnerability to other countries’ troubles. This was made clear by the recent global financial crisis and the ongoing economic recession in many advanced countries. In the wake of the global financial crisis, developing Asian economies are now adapting their development strategies and taking up the challenge of “rebalancing growth” towards greater reliance on domestic and regional demand (OECD and International Labour Office 2011). These countries are making adjustments to their labour market and social policies for a job-rich and sustainable recovery, albeit to different degrees and within their country-specific situation. It is in this context that most developing Asian countries are endeavouring to upgrade the skills of their labour force for sustained growth and further job creation, as skill development is a way for these countries to continue their growth and move from a middle-income country to a high-income country. For large economies, such as the People's Republic of China (PRC) or India, this means rebalancing their growth strategy from being dependent on foreign demand towards a greater reliance on domestic and regional demand. But for smaller economies, the prime objective is to move into newly growing industries. Each country has different objectives and adopts different strategies to attain them. Asian countries are among the most dynamic economies in the world. As a result of their rapid growth, several countries are experiencing skill shortages in higher-technology manufacturing. As a response, they have ambitious plans for increasing vocational education and training as part of their national development plans. However, it remains to be seen how these plans will be implemented at the local level. This chapter1 is divided into three sections: (1) skills challenges faced by Asian countries, (2) strategic approaches to skills development in Asian countries and (3) emerging policy themes. It draws on data and analysis from the following 15 countries: Australia; Cambodia; the PRC; Hong Kong, China; India; Japan; the Republic of Korea; Malaysia; Mongolia; Nepal; Pakistan; Philippines; Singapore; Thailand; and Viet Nam. A full discussion is found in OECD (2012). Building up a system for training or creating a training market. Many countries have an outdated system and lack sufficient facilities and equipment or qualified instructors. Several ways for building up the training system are being pursued, such as creating additional training academies, imposing skill levies and using apprenticeship models. A common element is increasing involvement of the private sector. Reducing skills mismatches and increasing the links between training and industry needs. As the industry skill demand is quickly upgrading, growing economies are faced with a widening gap between skill supply and demand. Several approaches are taken in this regard. One is the “train the trainers” model. If private sector initiative is weak in supplying training for new skills, the public sector can train and supply instructors for new skills as a public good. The cost is borne by the government or sometimes charged to companies. A second model is to give subsidies to a leading technology company to train not only their own workers but also workers from other small- to medium-sized companies or the unemployed. For example, Mongolia subsidies on-the-job training of the unemployed with its Employment Promotion Fund. The Philippines seeks to strengthen industry education and training linkages with an enterprise-based training system. Thailand provides incentives to companies including income tax breaks granted by the Skill Development Promotion Act of 2002 and has a National Vocational Training Coordination Committee for coordination with the private sector. Upgrading quality of skills training systems and improving outcomes. There is a need to assure the quality of skills training to create vocational pathways for high school leavers. In countries such as Cambodia, Indonesia, Lao People’s Democratic Republic, Mongolia, the Philippines and Viet Nam, despite the high unemployment rate among college graduates, vocational training is not considered as a viable alternative, and high school graduates value academic studies and target white collar jobs unrelated to industry demands. To improve the status of vocational training and attract youth to where there is demand, high-quality and competency-based training is needed. A National Qualification System (NQS) needs to be constructed. Quality assurance and industry ownership in training is often absent in developing countries and administrative problems or conflicts between authorities exist. For example, Pakistan plans to streamline the existing fragmented training system with a focus on centres of excellence. The PRC is setting up a national system of honours and rewards for skills masters in an effort to improve the public’s perception of skills training. Increasing industry participation and ownership. One of the major weaknesses in developing Asian countries’ skills development system is the lack of industry participation and ownership. The vast majority of firms are SMEs, and they hesitate to invest in workers’ skills as they lack resources and duration of expected employment relationship is short. On the other hand, public provision can be supply-oriented and fragmented with weak link with demands. Examples of private sector leadership can be found. Indonesia’s Malang Migrant Workers Training Centre is a privately owned training centre for female migrants, specialising in domestic work for households in Singapore and Hong Kong, China. The company that runs the centre has branches nationwide and offers training services for prospective migrants to the electronics sectors of neighbouring Malaysia (mostly men) as well. Nationwide, it sends 250 female workers into these occupations abroad every month. In this case, training is an integral part of the company’s service provision. Some examples of national strategies for skills development are presented in Box 9.1. These challenges are interrelated and cannot be addressed in isolation. In practice, this creates the challenge of integrating skills strategies, which requires a dedicated dialogue among different ministries and departments for policy cohesion and coordination. The issues of skills demand and supply, analysed in the next section, allow greater understanding the context to which these challenges apply. Enhance the role of the private sector in policy making, designing and setting standards in training. Improve apprenticeship training systems and provide more flexibility in industries’ selection of trainees and the structure of the training. Improve the perception of technical and vocational education and training (TVET) and attract more trainees. Develop highly effective TVET instructors. Streamline the delivery of TVET. Increase upskilling and on-the-job training of skilled workers. Accelerate the development of tertiary industry skilled workers – IT, service sector, etc. Low-carbon and green industry sector skilled workers. Employment trends by aggregated sectors (agriculture, industry and services) highlight the skills demands shifts (see Fig. 9.1). Agriculture is still a significant part of the economy but employment is moving towards industries. 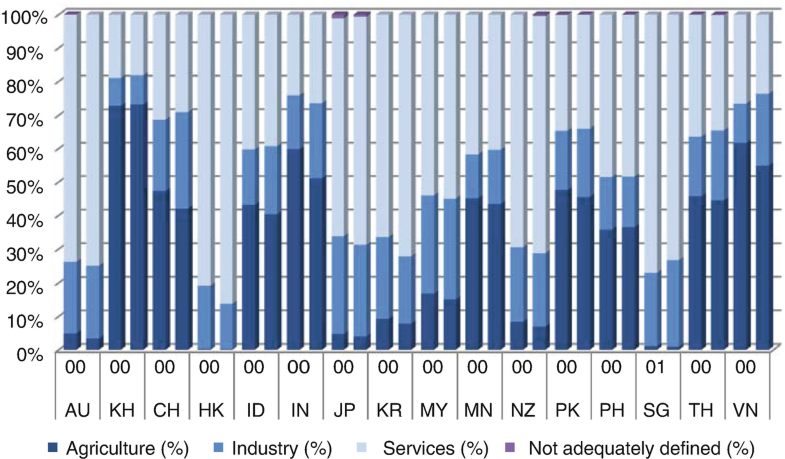 Services industry employment is not strong in most Asian countries. Agriculture. Five of the countries have large agriculture sectors, accounting for over 50% of employment: Cambodia (72.2% in 2008), India (51.1% in 2010), Myanmar (62.7% in 1998), Nepal (76.1% in 2001) and Viet Nam (51.7% in 2006). Large declines in agricultural employment are experienced in Viet Nam (−13.6%p from 2000 to 2006), the PRC (−10.4%p from 2000 to 2008) and Mongolia (−8.6%p from 2000 to 2009). Industry. Countries with large shares of employment in industry include the PRC (27.2% in 2008), Japan (25.3% in 2010) and Malaysia (27% in 2009), while it is just 8.6% in Cambodia (in 2008). Large declines in employment shares of industry were experienced in the Republic of Korea (−11.1%p between 2000 and 2010); Hong Kong, China (−7.9%p from 2000 to 2009); Japan (−5.9%p from 2000 to 2010); and Malaysia (−5.2%p from 2000 to 2009). Between manufacturing and construction, industry decline were in manufacturing, especially in Australia, the Republic of Korea, Malaysia, New Zealand and Singapore. However, Viet Nam experienced a large bound in industry employment (7.8%p from 2000 to 2006), followed by the PRC (4.7%p, 2000–2008) and Pakistan (2.1%p, 2000–2008). Services. Most developed economies have a heavy reliance (over 70%) on service skills including Australia (75.5% in 2009); Hong Kong, China (87.4% in 2009); the Republic of Korea (76.4% in 2010); and New Zealand (72.5% in 2009). Cambodia has the least services employment share (19.2% in 2008). Generally, in the past decade (2000–2010), there has been an overall rise in service employment, with major increases occurring in the Republic of Korea (15.2%p between 2000 and 2010), Malaysia (10.0%p from 2000 to 2009) and Hong Kong, China (8.0%p, 2000–2009). The share of employment in services reduced in the PRC, Mongolia, Thailand and Viet Nam over the last decade. Examining occupational structures by skills levels shows that, generally, the more developed the country is, the more highly skilled occupations are available, compared to developing countries which seem to rely on lower-skilled occupations. 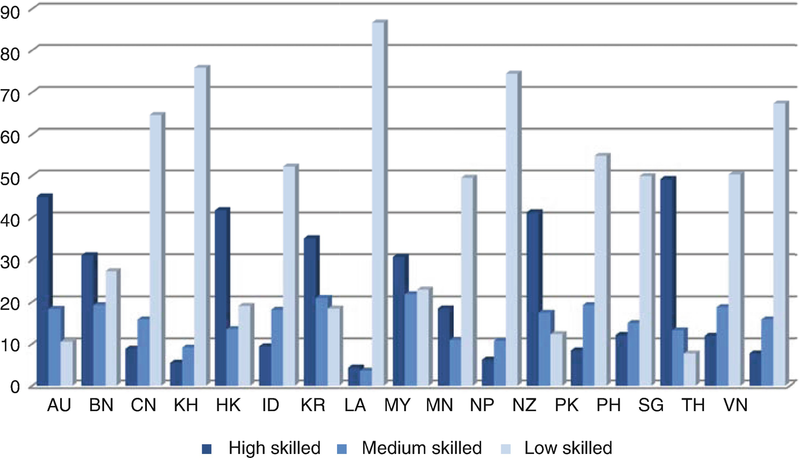 Higher-skilled occupations such as professionals, technicians, associate professionals and clerks are significantly advanced in the developed economies of Australia; Hong Kong, China; New Zealand; and Singapore, while Cambodia, Pakistan and Viet Nam are struggling to supply these types of skills (see Fig. 9.2 and Table 9.1 for more details). Figure 9.2 labels craft/related trades and plant/machine operators and assemblers as “medium skilled”. In this category, operators and assemblers are generally in the manufacturing sector and industrialised countries have more of these jobs. But the craft and trades category is consisted of diverse skill level workers, and a high share is found not only in Australia but in low-skilled countries as well such as Pakistan and Viet Nam. Figure 9.2 also shows the share of low-skilled agricultural and elementary occupations. As classification into occupations is not always compatible across countries, the shares are given as the sum of the two occupations. Several countries in the region are in a state of low-skill equilibrium. There is a high share of low-skilled workers in Cambodia, Mongolia, Pakistan, the Philippines and Viet Nam. These countries are faced with skills development demands for upskilling. Occupational structures show the level of skills a country has. The demand for skills training is derived from the need to align skills supply with demand. The change in shares of occupation shows the direction and the magnitude of the shifts in skills demand (see Table 9.1). Nepal and Viet Nam have growing demands for craft/trade and production workers. In Pakistan, Thailand, Viet Nam and Nepal, demands for production workers have increased. On the other hand, demands for agricultural workers and elementary occupations have declined. This shift in demand means that these countries need to train unskilled workers from rural areas to become production workers. In the more industrialised parts of Asia, demands for the medium-skilled occupations (craft/trades and operator/assembler workers) have declined fast in economies including Australia; Japan; Hong Kong, China; the Republic of Korea; Malaysia; and Singapore. In these countries, the demands for more highly skilled jobs such as professionals and associate professionals have increased instead. Economies in which the shares of professional and technician/associate professional workers have risen include Hong Kong, China; the Republic of Korea; Malaysia; and Singapore, in varying degrees. However, decline in production jobs is not entirely matched by growth of higher-skilled jobs. In all countries, the shares of elementary occupations have increased. Mongolia and the Philippines have experienced a reduction of craft/trades and production jobs and an increase of elementary occupations. The countries are faced with upskilling demands for a wide range of their unskilled workforce. Among the medium-skilled occupations of service and sales workers, the patterns are very diverse. Some countries experienced growth in these occupations while in other countries the shares have diminished, which reflects diverse economic conditions of the countries. Looking at the labour force by educational attainment (primary, secondary and tertiary) among the youth (15–29 years old) and adults (30+ years) highlights the areas where a more educated workforce is required. Figure 9.3 shows the level of educational attainment of the young and adult labour force in 2008. Primary Education. The countries with the highest percentage of the labour force with only a primary education include Indonesia and Pakistan; these countries have a significantly high percentage of labour force with either less than 1 year or only preprimary education. These countries have a definite demand for a universal primary education. All countries have experienced a decline in shares of primary education in their workforce (1998–2008), indicating that workforce education and skills development are increasing. Developed economies that generally experience lower levels of primary education only include Australia; Hong Kong, China; the Republic of Korea; Japan (before 2002 when primary and secondary education levels were combined); Malaysia; and New Zealand. Generally, the higher percentage of primary education only occurs in the adult age group, more significantly in Indonesia (75.1%), Pakistan (65.6%) and the Philippines (41.8%). Indonesia (61.3%) and Pakistan (59.0%) experienced the highest levels of primary education only within their youth (15–29 years old) labour force. Secondary Education. As Fig. 9.3 illustrates, the economies with the highest level of secondary education attainment in their labour force include Australia; Hong Kong, China; the Republic of Korea; Malaysia; and New Zealand. Countries that are struggling with secondary educated labour force skills include Indonesia and Pakistan; however, these countries are generally experiencing an increase in secondary education attainment. Among the youth labour force, secondary educational attainment dominates in all countries, most significantly in Singapore (63.5%) and Malaysia (63.0%). Tertiary Education. All countries are experiencing an increase in tertiary educational attainment within the workforce, with some more prominently than others. Indonesia has the lowest percentage of its labour force with a tertiary education, while Australia, the Republic of Korea, Japan and New Zealand have the highest percentage, indicating a highly skilled workforce. Generally, the youth have higher ratios of tertiary educational attainment, indicating a rising skills level across age cohorts. 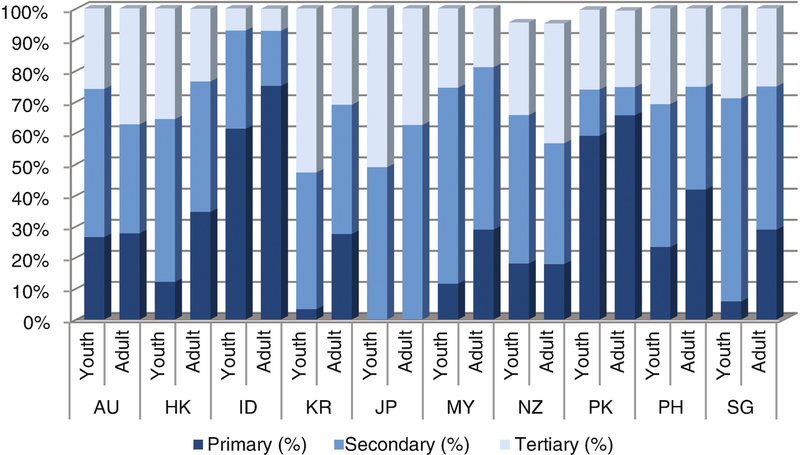 The Republic of Korea (52.7%) has a majority of its young labour force with a tertiary education, followed by Japan (51.0%); Hong Kong, China (35.6%); New Zealand (29.8%); Singapore (28.9%); and Australia (25.9%). As the tertiary education system varies a lot across countries, a large number of tertiary education graduates do not always equate to an ample supply of new skills in the labour force. 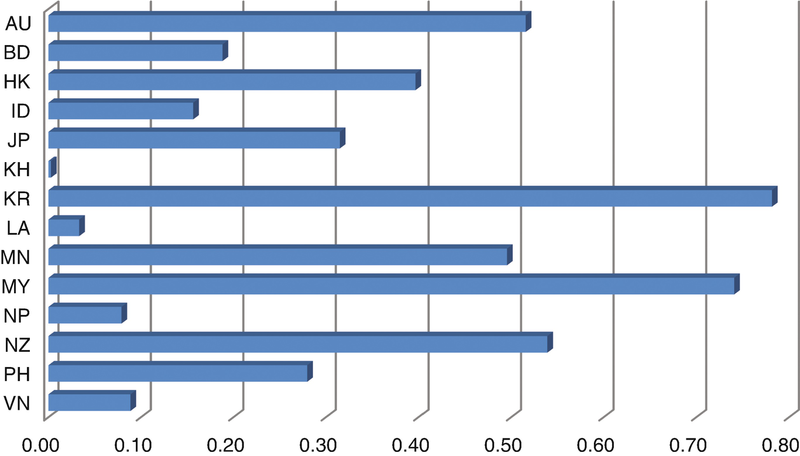 Figure 9.4 compares the number of science and engineering graduates as a percentage of the total labour force to measure inflow of new knowledge to existing labour force. In Australia, the Republic of Korea, Malaysia, Mongolia and New Zealand, it is around 0.4% of the total labour force. But in Cambodia, Lao People’s Democratic Republic, Nepal and Viet Nam, the inflow of this type of knowledge into the labour force is insufficient, as their colleges and universities do not produce sufficient numbers of graduates in these fields. Countries need to increase the supply of science and technology personnel given their importance to innovation processes, particularly in advanced manufacturing and services industries. The PRC has a great emphasis on science and technical professionals, but unfortunately a comparable statistic is not available. All science and technology workers can be considered “knowledge workers”, and calculating their number is a useful way of examining and interpreting the knowledge dynamics of a region (Sharpe and Martinez-Fernandez 2007). There is a mix of approaches to skills development. Most countries are strengthening technical and vocational education with some countries focusing on basic education. This approach is largely driven by public institutions; however, it needs greater investment. More workplace training is needed for high-skilled workers, but above all transition economies in Asia lack the needed market system. Large economies, such as the PRC, have large-scale investments in home-grown technology. India has developed sophisticated high-value technology services significantly leveraging its science and technology systems. At the same time, there are local initiatives for specialised technology and services such as financial talents in Shanghai or SME entrepreneurs’ managerial skills in Japan that foster skills and training ecosystems in particular places. Most countries are addressing the skills development needs of the transition to a green growth economy. This section discusses four approaches that are taken by the Asian countries: (1) strengthening technical and vocational education and training (TVET) systems, (2) fostering knowledge intensity through workplace training, (3) developing local skills ecosystems and (4) integrating skills and technologies for green growth. A strong vocational skill is built upon a background of solid primary education. In several Asian countries, primary education is not universal; hence, its expansion to the whole population is among the primary goals in their human resource development strategy. The PRC views general primary education as a key strategy for equality and has extended a free compulsory 9-year education nationwide in 2008, with priorities given to rural areas, outlying poverty regions and ethnic minority groups to narrow urban–rural and regional income gaps. The PRC invests hugely in education, and its human capital development spending amounted to 11% of total GDP in 2008. The PRC provides financial aids to students in higher education to raise enrolment: 90% of secondary vocational school students and 20% of university students received some sort of financial support. Expanding vocational education at the secondary education stage is another key strategy in Asian countries. As many students do not complete secondary education, vocational education is viewed as a desirable option in raising their skills and in promoting equality. But a common impediment is the existing negative perception towards vocational education as a second-class education and the consequent low participation rate. One of the reasons for poor employment outcome is the weak link between vocational education and labour market. Diverse policy measures are taken to overcome this perception and provide incentives for the youth to choose vocational education. In Cambodia, technical and vocational education (TVE) is a strategy for integrating the youth, especially in rural and poverty areas, and having them contribute to the social and economic development of the country. Its nationwide enrolment rate in basic education is high at 94.8%, but the enrolment rate at the lower and upper secondary education is very low at just 31.9 and 19.4%, respectively. The dropout rate is high at 18.8% in the lower secondary and at 11.3% in the higher secondary education. Cambodia believes that expanding TVE with a solid link to labour markets will contribute to social stability, inclusion, poverty reduction and sustainable economic growth, and the Education Strategic Plan for 2009–2013 of the Ministry of Education, Youth and Sport (2010) states technical and vocational education expansion at the secondary educational level as a major policy objective. But the challenges are its high cost and the existing low perception towards TVE. To resolve these problems, Cambodia seeks to diversify TVE provision gradually with higher private sector participation, employers’ investment and multilateral involvement. To improve the public perception and low demand for TVE, several steps are being taken, such as institutional capacity building and quality improvement before quantity expansion. Pakistan is faced with a similar problem. Compared to general education, vocational training has been relatively neglected and is fragmented and supply-oriented. Pakistan is trying to transform itself from a middle-income to a high-income country through a human capital development strategy entitled “Skilling Pakistan”, and it is faced with the following issues in its TVET system: (1) due to the low perception and low quality of training education, students do not consider training as a viable and mainstream alternative, and enter the labour market with low skills; (2) industries’ general perception of the quality of technical/skills education is low and a shortage of skilled labour is listed as one of the major constraints for investment; and (3) employees’ low expectations of the prospects of technical/skills education courses and hence their low take-ups. The South Asian countries of Bangladesh, Nepal, Pakistan and Sri Lanka have particularly high youth unemployment, despite the region’s economic growth surge last decade. In these countries, overseas employment is an important option for the youth. In order to prepare them for a gainful foreign employment, they need a skill development programme targeted at the unemployed youth, with a systematic planning, foreign market surveys, information on foreign employment systems and identification of needed skills. Malaysia considers quality improvement as the key element in increasing enrolment in technical education and vocational training (TVET). 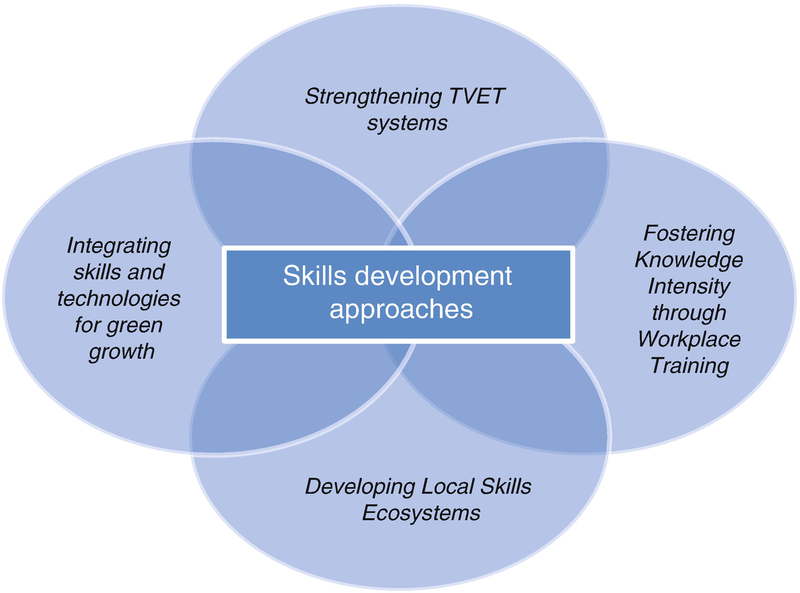 Malaysia adopted the following four strategies in its Tenth Economic Plan (2011–2015) to widen broaden the access to quality TVET: (1) improve the perception of TVET and attract more trainees, (2) develop highly effective TVET instructors, (3) upgrade and align TVET curriculum with industry needs and (4) streamline the delivery of TVET. Thailand has set the policy goal of “No youth entering the labour market without proper skills training by 2020”. The country has a large-scale training system for the youth. As of 2007, about 1.5 million students were in diverse training institutions under the Ministry of Education. The other problem faced by Asian countries is increasing knowledge intensity and skills development in the workplace. Asian countries commonly have a large share of unskilled and semi-skilled workers. To move out of a middle-income trap to a higher value-added production and towards a sustained growth path, workplace training is becoming a key agenda item. Skill shortages are becoming an impediment for their sustained growth, and countries are seeking to upskill their labour force through workplace training. A common problem in promoting workplace training is the low-skill investment of the industries. To overcome this problem, several countries have introduced incentives including tax exemptions for training costs to promote workplace training. Malaysia uses the Tenth Plan period (2011–2015) to revamp its educational system to significantly raise students’ skills to increase their employability. Currently, the workforce in Malaysia remains relatively unskilled, with 77% of the labour force with only up to 11 years of education and with only 28% of the jobs in the higher-skill bracket. The Economic Planning Unit’s baseline scenario projects that this share will reach 32% by 2020. But for Malaysia to be on par with high-income regional peers such as the Republic of Korea, Singapore and Taipei,China, this target would need to be increased to 35%. The government aims to increase this share to 33% by 2015. Achieving this goal requires greater involvement of the private sector. The government will expand the coverage of the Skills Development Fund to promote upskilling and retraining workers. The coverage will be extended beyond school leavers to include existing workers, and preferential loans will be provided to pay for workers’ costs incurred in skills upgrading. The Recognition of Prior Learning (RPL) programme will be expanded and grant the Malaysian Skills Certificate to workers who do not have any formal certification but who have obtained relevant knowledge, experience and skills in the workplace to enhance their career prospects as well as to encourage and reward lifelong learning among the workforce. In the case of Viet Nam, although it is an export-oriented economy, the impact of the global financial crisis upon its exports has been modest. However, Viet Nam faces enormous training demands. Among its approximately 50 million labour force, 33 million (65%) are unskilled workers. The addition of five million jobs in industry and the services sector between 2005 and 2009 barely affected the rural area primary sector. The share of the primary sector in production has remained at around 20% during the last decade with a labour force of 24 million. Along with structural development, workforce training constitutes a key element in the country’s employment growth strategy. Viet Nam takes a two-pronged approach: higher education reform to mitigate the shortage of skilled professional workers and a workforce vocational training programme to create jobs. The government approved training programmes, which cover one million trainees annually during 2010–2015, and target the youth, textile and garment industry workers, and women. For higher education reform, the programme focuses on improving the quality of universities. The reform programme aims at more autonomy and more accountability and improved funding for universities, as well as training 20,000 faculty members up to doctoral level qualifications by 2020. In Thailand, the very large agricultural sector accounted for 41.5% of its workforce in 2010. Employment in industry is 19.5% but signs of manufacturing sector adjustment in labour intensive industries have already begun to appear as employment growth is stagnant in that sector. In response, the government plans to support higher-technology skills training in order to facilitate an industrial transition. However, a great majority of the country’s enterprises are SMEs with a high employment share but with a small output share and without a proper capacity for providing training. About five million workers are in training programmes managed by the Ministry of Labour, with additional two million workers in other ministries’ programmes. Within the programmes, private sector training accounts for about 5.3 million places or 74% of total training. The Thai Government issued the Skill Development Promotion Act in 2002 to promote workplace training with a combination of compulsory measures and incentives. The act encourages enterprises to establish themselves as training providers and conduct skills training in the workplace. An income tax exemption is provided to cover the cost of the training. In 2010, about 2.4 million workers were enrolled in enterprise training programmes. Mongolia has been faced with a widening mismatch between the training provided by existing public training institutions and the industry skills demand. The existing public training institutions lack resources and capacity, while skills demand is rapidly upgrading. Small- and medium-sized enterprises are often unable or unwilling to provide their workers with sufficient training. To make up for the deficient skills training and to facilitate a flexible and quick upgrading of skills under a competitive market environment, the Mongolian Government encourages and subsidises on-the-job training in enterprises for the unemployed with its Employment Promotion Fund. Trainees are provided with 4 months of production site training paid for by subsidies that cover the training expenses. For the employers who offer the on-the-job training for the unemployed, the training cost is reimbursed. In the construction industry, 3,000 unemployed were trained and 80% of them landed at jobs in 2009. The services sector and entrepreneurship training is conducted in business centres. The skills demand in Cambodia’s is for low-skilled workers, and this demand reinforces the current low-skills equilibrium in the country. Besides boosting economic growth, the Royal Government Cambodia (RGC) may well need to help firms move up-market in terms of product market strategy, technology uptake, innovation and skill need and usage, in order to break the current low-skill equilibrium. For example, the garment industry currently requires new technology to underpin its longer-term sustainability. The focus on demand-side skills and labour market issues are designed to support the skills upgrading and utilisation processes that are required in Cambodia in order to underpin the Supreme National Economic Council’s (SNEC) pending industry development policy. The industry development policy should strengthen economic growth by providing the right business environment and incentivising local industry to grow through adopting higher-order product market strategies and sound business improvement practices. Business improvement practices must address optimal development and deployment of labour as such behaviour is the essence of demand-side skills and labour strategies. Integrated and balanced skills and labour strategies could include (1) mobilising national initiatives, (2) supporting local skills upgrading and employment initiatives and (3) dealing with infrastructure for employment and training programmes (Eddington 2012). In Japan, SMEs employ 74% of total manufacturing employees, but job creation is not active. Under the current global business environment, not only large multinational corporations but local SMEs as well are increasingly influenced by the sophisticated global value chains helped by information technology (IT) and free trade agreements (FTAs), including economic partnership agreements (EPAs). Many multinational corporations’ FDI destinations are geared towards where there are reliable supporting industries, which are mostly made up of SMEs. And in such cases, specialised SMEs can readily make up a part of the global value chains. Furthermore, in rapidly growing middle-class markets in Asia and other emerging economies, product specifications need to be strategically defined, in which specialised SMEs can be better integrated into the global value chains. In addition, SMEs are less affected by the impact of the crisis and can serve as an important job creation engine in such situations. Just after the financial crisis hit the world, what most countries witnessed was an evaporation of liquidity for financing SME business activities. Therefore, securing access to financing (working capital as well as investment capital) for SMEs are crucial. In the past, to facilitate growth and innovation, government policy for supporting SMEs’ access to financing tended to focus on investment capital. However, amid the current crisis, not only investment capital but also working capital is essential for their survival. More specifically, the current crisis epitomises that SMEs need to know how to secure capital, especially working capital, under a tight capital market. SMEs tend to lack reliable documents for financing purposes, not to mention detailed business plans, future projections, etc. In this context, SMEs need to be equipped with knowledge on financing, and this should be included in the skills list needed for SMEs. The share of micro-, small- and medium-sized enterprises (MSMEs) is large in the Philippines, accounting for 70% of total employment, 30% of total sales and value-added in manufacturing and 25% of total exports. The demand for training in the Philippines is twofold: the existing and potential entrepreneurs need business skills and knowledge to be competitive in the world market, particularly in financing, marketing, technology and human resources development, and the MSME workers need to be trained for skills required in technology-intensive industries and for improving productivity. The needs are even higher for smaller MSMEs. However, employer-provided training is very limited and the following constraints have been cited: insufficient access to finance, poor information on training needs, low perception of formal training and lack of training facilities. The government and the education and training institutions, both public and private, are the major providers of the needed skills training for the MSMEs, in which the Technical Education and Skills Development Authority (TESDA) is the lead government agency for managing TVET. Developing Asian countries commonly face a lack of skills development in SMEs, especially internal training, a focus which is not well developed by donor agencies either, whose efforts tend to focus much more on physical infrastructure development (Usui and Martinez-Fernandez 2011). However, lack of training in SMEs is not confined to developing countries, and many OECD countries face similar problems (OECD forthcoming). In Australia, small firms with less than 20 employees constitute the vast majority of businesses, and nearly two thirds of them are very small, microbusinesses with 1–4 employees. They collectively employ nearly half of the workforce (48% in June 2009), with another 23% of employed people working in medium-sized businesses with 20–199 employees. But small businesses are less likely to use formal (nationally accredited) and structured training than larger firms and more likely not to train their staff at all. Small businesses tend to respond that their staff already have adequate skills or more skills than needed, indicating that many small businesses are not seeking growth or change. However, even in small firms, training is often associated with innovation, growth or restructuring, and training programmes need to be tailored so that they favour and engage the demands of small businesses. Small- and medium-sized businesses are more likely to report skill shortages as a factor hampering innovation than larger ones. As small businesses are more likely to be locally owned, they are less able to draw on expertise from outside. Recently, small- and medium-sized innovating firms are reporting more difficulties accessing suitable skills compared to larger firms. The gap on this issue is larger than for any other barriers such as access to funds for innovation, and it appears to have widened during the last decade. In order to better connect small businesses with formal and structured training and to link them with innovation, Australia undertook the National Skill Ecosystem Programme in the early 2000s which was based on firms in an industry or region working together on a skill and workforce issue. In the programme, businesses take more responsibility for the training and development of their own workforces, but also they work with outside experts such as research and educational institutes for new ideas and approaches. The PRC’s long-term human resources development strategy in the new century puts a great emphasis on high-quality science and technology personnel. The PRC plans to produce an enormous amount of high-quality and professional science and technology human resources as outlined in several of its national plans for the 2000s, such as the Tenth Five-Year Plan for National Economic and Social Development (2001), The Guidelines on National Medium- and Long-Term Program for Scientific and Technological Development, 2006–2020 (2006), The National Outline for Medium- and Long-Term Talent Development, 2010–2020 (2010a) and The National Plan for Medium- and Long-term Education Reform and Development, 2010–2020 (2010b). To become an innovation-led economy, the PRC has launched various high-tech R&D and basic science research programmes and centres at the national level, and established science and research foundations. In addition, the government invests in upgrading technical professionals. In 2008, the PRC had about two million R&D personnel, three times the number in 1991. Local skills ecosystems include organisations, institutions and firms in a certain local area or labour market that constitute area-based partnerships for training and skills development (OECD forthcoming). There are many advantages in putting more emphasis on devolving more responsibility and resources for partnership development to the local level. In addition, in Asia there is an increased need for flexibility and adaptability in skills development and the changing modes of skill acquisitions. Skills have traditionally been acquired through schools and vocational education systems and passed on through family or community networks. However, increasingly more skills are acquired from multiple sources including workshops, short courses, online, on-the-job and learning by doing. Skills are increasingly developed through face-to-face communication, particularly taking into account local cultural and socio-economic characteristics. Hence, local skills partnerships are not just for providing skills, they are for knowledge exchange as well. Local partnerships in training have advantages in that local agents are better able to develop skills that meet their specific needs, increase knowledge flows and information within communities, drive local innovation through new ideas, utilise local knowledge, develop capabilities and skills and common ownership, increase transparency and accountability, and supplement limited resources of the formal education and training system. However, there are many challenges in designing and promoting local partnerships. More trust has to be consolidated in market relationships, and it has to be sustainable as the returns tend to be over the longer term. The objectives for local partnerships have to be clear from the start, and cooperation and the balance of power has to be secured. In many ways, the role of centralised agencies is increased through local partnerships. For example, in education and training, central agencies can contribute by providing the policy, regulation and planning framework for local initiatives, by supporting local partners with information and forecasts, curriculum development, quality and accreditation assessment, evaluation and monitoring, and funding for the local partners to meet the agreed funding criteria. As an example, Thailand’s skills training strategy emphasises local initiatives. Thailand’s regional offices are equipped with the capacity for designing and developing training curricula and the network for training, and training can be provided more efficiently thanks to the flexibility they are granted. Budgets for partnerships are given as a lump sum according to the regulations of the authority. A more integrated and robust example of fostering local skills ecosystems is the decision of the PRC Government in 1992 to speed up the process of developing Shanghai into an international financial centre in response to increasing economic globalisation and global financial competition. A serious bottleneck was the lack of competent financial talents in the city. To resolve the manpower problem, the municipal government of Shanghai decided to invest in the following areas: (1) to develop local financial talents, (2) to recruit high-level overseas financial talents and (3) to improve the environment for the talents. To nurture local financial talents, Shanghai built a sound system for developing financial talent including improved curricula at universities, high-end professional training and internal training within financial institutions. In 2010, four top-notch universities were designated as training bases by the municipal government, and financial institutions are advised to cooperate with them for training. Shanghai built high-level financial training bases with international standards relying upon foreign universities and financial institutions. Firms are encouraged to train their employees abroad. The knowledge and capabilities of existing executives at financial institutions were updated through executive MBA programmes in top business schools, outbound programme training and knowledge updating programmes. To facilitate the recruitment of high-level overseas talents, the Shanghai municipal government launched programmes for attracting 10,000 overseas Chinese talents in 2003, the Shanghai Pujiang Talent Programme in 2005 and the Young Talent Returning Programme in 2008. Shanghai cooperates with many overseas Chinese organisations for recruiting financial talents. The municipal government recommends recruiting overseas talents at senior or key positions and supports system changes favourable to overseas talents. City officials make regular visits and communicate with the overseas talents to better meet their needs. Finally, to create a comfortable living and working environment for the financial talents, Shanghai provided them with career development opportunities, preferential policies, and services and cultural and living facilities. The municipal government endeavoured to invite Chinese and foreign financial institutions to locate their headquarters or regional headquarters in Shanghai. Many preferential policies were enacted in terms of healthcare, education and credential handling procedures for their children, and their residential and taxation status. As a result of the city’s efforts, the size of financial industry employment in Shanghai jumped from 130,000 in 2000 to 231,900 in 2010. The financial industry has now grown beyond the banking business to securities, insurances, futures and trust. According to the Chinese Academy of Social Science’s global financial centre rankings of 2011, Shanghai is ranked as the fifth most competitive among the 75 global financial centres along with Tokyo, following London; New York; Hong Kong, China; and Singapore. Asian countries perceive the move towards a green economy both as a new challenge and a new opportunity. Several countries in the region have very large carbon dioxide footprints, and the transition mandates revising their planned growth strategy. At the same time, they also aim to join one of the world’s hub countries in new technology. Innovations and advent of new technologies offers them an opportunity to join the technology leading countries in the world. Many Asian countries are setting up ambitious targets and responding proactively to the transition. The Republic of Korea announced its National Strategy for Green Growth in 2009, which set up an ambitious goal of raising the share of new and renewable energy from 2.7% of 2009 to 2.8% by 2013 and to 6.1% by 2020. It aims to join the World’s 7 Green Powers by 2020. Singapore has set up a carbon emission reduction goal of 7–11% from the BAU (business as usual) level by 2020, which can be extendable to 16% if a global agreement is reached. Singapore developed a national framework for sustainable growth in 2008, documented in the “Sustainable Singapore Blueprint”, according to which energy efficiency will be raised by 35% from its 2005 level by 2030. The Energy Conservation Act is expected to take effect in 2013 and will require companies with large energy consumption to appoint an energy monitor officer and report energy use to the National Environment Agency (NEA) and submit improvement plans to improve energy efficiency. Australia demonstrated its commitment to build a stronger and greener economy by developing policies that will boost green collar jobs, such as energy efficiency strategies for buildings and industry, rapid expansion of clean energy infrastructure, structural reform of emission-intensive industries, a cleaner vehicle fleet and public transport infrastructure plan; and targeted regional investment and industry planning. Aside from such national level issues, achieving a green economy requires a diverse range of workers with broad skill sets, not only technology and R&D professionals but also workplace skilled workers who can cope with the skilled demand shifts. Singapore is focusing on green technology personnel: the Building and Construction Authority estimates that at least 18,000–20,000 “green specialists” are required by 2030 in the building sector. The Environment and Water Industry Programme has allocated SGD 470 million to promote research and development in water sector including manpower development and commercialisation of technology. The Singapore Business Federation predicts an increasing demand for sustainability professionals like engineering or audit professionals and is working with universities and research institutes to address the skills demands. In Australia, the move to a low-carbon economy is expected to create thousands of extra jobs, as well as the recreation of hundreds of thousands of existing jobs. The reskilling, cross-skilling and upskilling of new work practices and workers are needed, and this can provide a window of opportunity for the disadvantaged group. But to grasp this opportunity, educating communities should be able to ensure candidates to obtain the training necessary to gain sustainable employment in the green collar sectors. Australia tries to achieve this through integration of the school system, VET system, trade colleges and universities. The National Green Skills Agreement between the federal, state and territory governments seeks to build up the capacity of the VET sector to deliver the skills required in the workplace and to enable individuals, business and communities to adjust to and prosper in a sustainable, low-carbon economy. Included in the agreement is the review and revision of training packages to incorporate skills for sustainability, development of national standards of sustainability practice and teaching in vocational training, the upskilling of VET practitioners so that they could offer quality in skills. In the Republic of Korea, the green growth is a part of the economic stimulus programme to overcome the effects of the worldwide recession. Out of the total USD38 billion stimulus package, 80% was assigned to environmental projects such as fresh water, waste control, energy efficient buildings, renewable energy, low-carbon vehicles and rail network systems. In the medium term, the government is focusing on public credit guarantees for green technologies and industries and introducing a carbon emission trading system and tax incentives for energy saving. The total budget for the green initiative was set at 2% of GDP for 2009–2013. On the human resources and social policy side, the transition requires human resources development for green technology R&D, retraining existing workers for green technology and a new system of active labour market programmes for displaced workers as well as a new social safety net for them. For the less-developed economies, green growth is a challenge in their development path because it could mean a widening knowledge gap and slowdown in growth as the introduction of mass production becomes harder. The implication of not catching up with the green growth trend could be increased poverty and job insecurity. Countries such as India and Thailand feel the need for a more proactive policy and public and private investment expansion to close the skill gap and to monitor progression in low-carbon technologies. On the training side, the transition to low-carbon growth poses two challenges: the countries do not have sufficient skilled manpower for green jobs, and they have retraining demands for those affected by skills demand shifts. Thailand puts more emphasis on manpower training in green jobs, understanding that green growth would intensify skills demands in the area and the green training would become a crucial element in future human development. For policy implementation, it extensively uses the Skill Development Promotion Act of 2002 which covers the cost of private enterprises’ green training by means of corporate income tax reduction. Along with the training expansion, Thailand seeks to introduce measures and systems for an extended social safety net. India has incorporated the sustainable growth process as a focal area in its growth strategy plan within the 12th Five-Year Plan of 2012–2017. The strategy covers areas of agriculture, waste management, energy, transport, and services and addresses mapping of skills, creating a registry of skills, infrastructure for skill development and involvement of the private sector and civil society in skill building. India’s policy focus is on a sustainable and inclusive growth strategy, as the adoption of greener technology would affect the labour market in terms of change in occupational structure as well as associated skill levels. Low-carbon growth is expected to create millions of (green) jobs in India in different sectors, requiring different skill sets and competency levels which may or may not exist in the current skill structure. However, no comprehensive training plan has been elaborated. Lower-level skills training is carried out by local governments, but industry linkages with the training institutes are weak, and efforts are underway to upscale the initiatives through sector skill councils. Although new higher-level skills in relation to new green occupations are not yet available, they are being developed at diverse universities and research institutes with government financial support. Asian countries are utilising different strategic approaches to skills development. (See Fig. 9.5. ): (1) strengthening technical and vocational education and training (TVET) systems, (2) fostering knowledge intensity through workplace training, (3) developing local skills ecosystems and (4) integrating skills for green growth. Strengthening TVET and secondary education systems requires a shift from curricula-based approach to competency-based training and creating a demand-driven training system which is responsive to industry needs. Corrective measures are needed, among others: (1) streamlining policy making and reorganising the current procedural overlaps among institutions, (2) setting up sector-specific centres of excellence, located in proximity to relevant industries and (3) institutionalising industry’s role in policy making. Workplace training in most Asian countries lacks a well-developed training infrastructure at the institutional level. Therefore, developing firms’ capacity as training partners or training organisations is a pathway that can be faster and more sustainable for increasing the level of skills and the level of knowledge intensity in firms. In particular, SMEs are suffering the most from the struggle on skills development and the skills gaps they experience. Ultimately, increasing firms’ level of knowledge intensity increases innovation and productivity for innovation and commercialisation which pushes workforce skills development internally and is directly related to the production pathway of the firms (Martinez-Fernandez et al. 2011). Local skills and training ecosystems can provide a network mechanism for vocational training coordination by involving more industry in training, better placing trainees in firms and providing improved incentives for training that better respond to the market in terms of satisfying employers’ changing demands. The impact of developing local skills ecosystems and fostering local skills initiatives is less known in Asian countries but some examples of integrated strategies driven by national authorities have had successful results, e.g. Shanghai finance skills strategy. Green growth has become an opportunity for many Asian countries to integrate their skills strategies and connect into global development networks for new technologies and the development of green sectors. Not all countries can invest at the same level. For some countries, just raising awareness among their training systems and firms is the most feasible strategy; for others, strong investments in their science and technology systems and skills and training systems are linked to job creation and sustainable development. The skills development programmes and policies analysed in this report indicate four levels of policy concern for a more integrated approach to skills development. The first level refers to “skills infrastructure and governance”. The second level refers to “the composition of the skills and jobs” as they relate to current employment. The third level refers to “the knowledge intensity in the workplace”. And the fourth level refers to “integrating skills strategies at the local level”. Asian countries face common challenges of building up skills infrastructure for creating a training market with quality suppliers, reducing skills mismatches, improving links between training and industry needs, upgrading outdated training systems and increasing industry participation. If public training systems are outdated and the elements of a training market are weak, the transition to the knowledge economy and the higher value-added to the dominant sectors will happen at a slower pace. Including those in the nonformal sector is also more difficult if governance of the skills system is not clear or well articulated in partnership with the private sector. Not much attention has been devoted to the development of knowledge workers in Asia. The higher-skilled occupations such as professionals, technicians, associate professionals and clerks are significantly advanced in the developed countries of Australia; Hong Kong, China; New Zealand; and Singapore while Cambodia, Pakistan and Viet Nam are struggling to supply these types of skills. Several countries in the region are in a state of low-skill equilibrium, particularly in Cambodia, Mongolia, Pakistan, the Philippines and Viet Nam. These countries are faced with skills development demands for upskilling. The shares of more highly skilled jobs such as professional and associate professionals have increased in most economies but the share is larger in the Republic of Korea; Hong Kong, China; Malaysia; and Singapore. The countries that have the highest percentage of their labour force with a primary education only include Indonesia and Pakistan. These countries have a definite demand for a more educated labour force. The economies with the highest level of secondary educational attainment by their labour force include Australia; Hong Kong, China; the Republic of Korea; Malaysia; and New Zealand. Countries that are struggling with insufficient secondary educated labour force skills include Indonesia and Pakistan; however, these countries are generally experiencing an increase in secondary educational attainment. Indonesia has a very low share of labour force with science, technology, engineering and mathematics (STEM) tertiary education, while Australia, Japan, the Republic of Korea and New Zealand have the highest percentage of labour force with a tertiary education, indicating a highly skilled workforce. In Australia, the Republic of Korea, Malaysia, Mongolia and New Zealand, new STEM graduates supply is approximately 0.4% of the total labour force each year. But in Cambodia, Lao People’s Democratic Republic, Nepal and Viet Nam the inflow of these types of knowledge into the labour force is insufficient, as their colleges and universities do not produce sufficient numbers of graduates in these fields. Private sector development, both in the formal and non-formal sectors, strongly depends on raising the skills of the large share of unskilled and semi-skilled workforce. To move to higher value-added production and towards a sustained growth path, increasing the level of workplace training and the quality of training is becoming a key issue. A common problem in promoting workplace training is the low-skill investment of the industries. Less is known about how to increase knowledge intensity in the workplace as a way to address the needs of skilling professionals, firms and clusters in high-growth enterprises and industries. This is an urgent need both in countries in high-skill equilibrium and in countries presenting low-skill equilibrium so as to support those firms and sectors that are already embedded in global value chains and technological innovation networks. A particularly notable case is the need of the SME sector to know how to secure capital, especially working capital, in a tight capital market situation. SMEs tend to lack reliable documents for financing purposes, not to mention detailed business plans and future projections. In this context, SMEs need to be equipped with knowledge of sophisticated financing, and this should be built in in different ways for firm training. There are alternative ways for skills development and knowledge-intensive service activities already well utilised in OECD countries (OECD forthcoming), but how they relate to developing countries has still not been investigated. Asian countries are developing skills plans as national strategies and frameworks. In most cases there is little specification of how the plans will be implemented at the local level where they need to reach the workforce, firms and organisations. Some countries are now realising the advantages of developing local skills ecosystems and therefore integrating the local implementation into policies and programmes. However, this focus is more often stated in the most advanced countries. Skills development for transition to a green growth economy presents a useful example because for green growth, strategies for local skill development can be separated from the higher dimension national level policy. On a national level, it is about setting the right prices and guiding the direction of investment (OECD 2009), but on the local level it is about training and job placement in a changing environment (Martinez-Fernandez et al. 2010). The cases of the Republic of Korea and Thailand show the importance of the establishment of national strategic policy related to sustainable development and climate change. Without such strategic direction and investment, and without adjusting to the “right” prices, small- and medium-sized enterprises tend to hold back on “greening” activity, reporting that they do not know what to do or how to proceed, as is the case in Australia. For a “green” jobs skilling initiative, multiple stakeholders are involved in establishing industry development and skills development plans. The latter is essential to ensure that demand for new “green” skills and supply are balanced and strategically timed. Skills are wasted if they are supplied before industry is ready to use them, a situation which could lead to skill migration from the region. For the local training dimension, collaboration and flexibility are critical. As in other skills development, “green” skill development must add value to workforce capacity in a meaningful way, and it seems to work best when a regional/cluster approach is taken that fosters collaboration amongst multiple stakeholders. Investment is less effective when skills are provided in an isolated policy silo so facilitating skills and training ecosystems at the local level provides an invisible skills infrastructure that largely reaches stakeholders in connected activities to build capacities in human capital. We are grateful for inputs from two experts’ meetings of the OECD “Skills and Employment Strategies in Southeast Asia Initiative” (ESSSA) held in Tokyo in 2010 and Shanghai in 2011 on integrating skills development strategies. Open Access This chapter is distributed under the terms of the Creative Commons Attribution Non-commercial License which permits any non-commercial use, distribution, and reproduction in any medium, provided the original author(s) and source are credited.